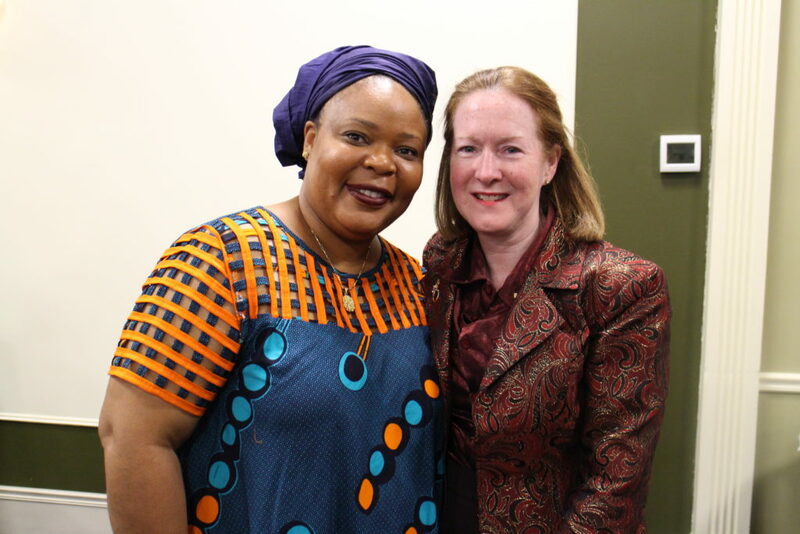 On February 24, Western CT State University held a public talk with Leymah Gbowee, a 2011 Nobel Peace Prize Laureate, offering a crowed auditorium the opportunity to listen to inspiring stories of continuous efforts in pursuit of peace and conflict resolution. The event was the first PeaceJam Conference for WCSU, which became a PeaceJam Chapter in the spring of 2016. PeaceJam is a global, not-for-profit, educational organization that inspires youth to change the world as they draw inspiration from studying the lives of Nobel Peace Prize Laureates, then meeting them and working directly with them through a PeaceJam conference. During the public talk, Ms. Gbowee, who was introduced by WCSU President, Dr. John B. Clark, as “indeed a great inspiration to us all,” reminded the audience of the strength in humanity over inhumanity, sharing many stories of determination in the face of injustice, violence and hopelessness. In 1991, when Ms. Gbowee returned to Liberia to work with women in rural communities who had suffered acts of violence during the war, her determination led to a peace movement that culminated with the end of the civil war in Liberia in 2003 and the rise of the first female president to rule a country on the African continent. “We created a space called the Young Girls Transformative Project. We go into rural communities and all we do, like has been done in this room, is create the space,” she shared. “When these girls sit, you unlock intelligence, you unlock passion, you unlock commitment, you unlock focus, you unlock great leaders,” said WCSU Professor of Political Science, Dr. Chris Kukk, quoting the words of Ms. Gbowee. A peace activist, trained social worker and women’s rights activist, Ms. Gbowee is also the founder and president of Gbowee Peace Foundation Africa, a nongovernmental organization based in Monrovia, Liberia that provides educational and leadership development opportunities for Liberians through scholarships, internships, youth gathering, and organizing urban and rural community development programs. “When you use your voice to speak truth, it becomes borderless… When you use your voice in this world that is crying out for people to use their voices for good, you are saying to the next generation of leaders that good can definitely overcome evil,” concluded Ms. Gbowee. Ms. Gbowee’s story is told in the documentary “Pray the Devil Back to Hell,” produced by Abigail Disney and her autobiography is recounted in the book Mighty Be Our Powers. PeaceJam has been operating in New England since 2006 and it is hosted by WCSU’s Center for Compassion, Creativity & Innovation, The Center for Student Involvement, Pre-Collegiate & Access Programs and the Kathwari Honors program, led by Professor of Political Science Dr. Chris Kukk. For more information, visit www.wcsu.edu/peacejam/ or call the Office of University Relations at (203) 837-8486.